When I was little, I saw a ballet book. I yelled to my mom, "Look, a ballet (pronouncing it "Bal-it) book. It must have really embarrassed me, because I can remember it to this day. I hate it. That's why the kids today have no idea how to spell. 3. Tell me about your high school senior picture. Please feel free to post. YUCK. My formal picture came out pretty well. The one that went into the yearbook looked like I had taken/smoked something before I had the picture made...the sun was actually in my eyes. 5. Share a high school or college homecoming memory. High school homecoming wasn't any really big deal. In college, I had to choose between the social fraternity (I was a "little sister") and the professional music fraternity. I was a "brother" in the music fraternity...we had a co-ed chapter. If I'm remembering correctly, I usually went to the music festivities since I was in the band. I think I may have at least popped by the social fraternity's party, but I honestly can't remember. Must have been a really good time. 6. Linda at Mocha with Linda wants to know: "Do you prefer sunrises or sunsets?" I'm going to wimp out on this one and say I don't have a preference. Both are equally beautiful. 7. Lea at Cici's Corner asks, "What is something you have not done that you desire to do?" Go to Germany/Austria/Switzerland with a side trip to Liechtenstein. Yes, again with the Liechtenstein! I also want to go to Canada and see the Polar Bears...as long as I can leave my hotel in the morning, meet up with the bears that afternoon, and get back to the hotel that night. 8. Carol at Wanderings of an Elusive Mind ponders, "If you could come back [in another life] as an animal, which would it be?" A dog. Definitely a dog. One of my dogs 'cause they have it made. 9. Joyce from The Other Side of the Pond is curious: "Where were you 10 years ago?" Please feel free to elaborate more than just your physical location. 10 years ago today: I was 20 pounds lighter; the boys had their first trip to Disneyworld, and I had my gall bladder removed in August. We were living in SC. I honestly can't remember any more than that! 10. When you are proven to be correct in any contentious discussion, do you gloat? It depends who I'm with. My family: absolutely. Any one else, not so much. 11. What is your favorite food which includes the ingredient "caramel?" I hate these questions when you're only suppose to pick one! I make some mean "Texas Millionaires": they're kinda like Turtles but a lot better. I'm also very fond of the little snacks where you take a small pretzel, put a rolo on it, pop it in the oven for about 3 minutes, then put a pecan on top. DELISH! When I was little I would've said The Brady Bunch. Now? How about the NCIS family? Cozying up to Jethro could be nice! Please post your answers tomorrow, then come back here to link up. 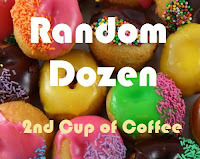 Happy Randomizing! Awwwww... I bet LOTS of kids make that mistake with ballet! How's a kid supposed to know...? I have to admit Lichtenstein looks beautiful... but entirely too COLD for me! Texas Millionaires-forgot about those. I used to make them. So much good stuff out there to eat that I just shouldn't eat. I'm going to bake something this week and am using the daughter coming home as my excuse. Ahhh...Disney World...I remember those days!! We had seasonal passes and took frequent trips! Sing with me..."It's a small world after all..."
Love your randoms, but I mainly stopped by to tell you that I'm wearing purple with you on the 20th! Had to click on the link, beautiful video. I totally agree with #2. That's why my kids don't text. My 12 year old step-daughter does and it drives me insane. See? Now, I still want Brady Bunch, just because they have Alice to cook and clean. But the whole one bathroom/6 kids things has to go...he was an architect for goodness' sake! Couldn't he have added a bathroom?!? I look forward to going back to Disney. I would also have to say The Ingalls, I loved the books. Very cute and interesting answers. I have not had a rolo in years....now craving them!!! When I was in 8th grade, I was called on to read in class. I had never seen the word "picturesque" before. Loud and clear, I read "pictures-cue." Like you, I must have been embarrassed because I still clearly remember it. ok...I want the recipes for the caramel things....I adore caramel...probably more than chocolate. I keep forgetting to make those pretzels with the Rolo. Putting that on my grocery list! I agree with loving both sunrise & sunsets. Liechtenstein looks awesome. Loved reading your answers. Enjoyed your answers. Now you can do a post with your recipes. We would love it. lol. The rolo and pretzel thing I had never heard that one. Do you use a microwave? And how long? It would probably be easier just to post it...lol just saying.